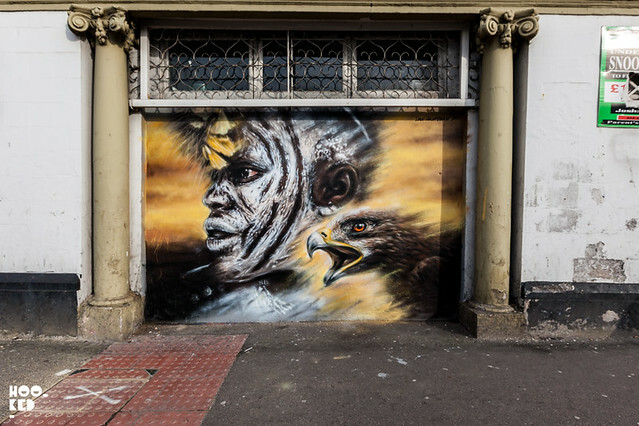 East London's Wood Street Walls Project continue to bring art to the streets of Walthamstow with the addition of their lastest mural featuring the work of London based artist Dale Grimshaw. Following a recent leg injury which saw the artist out of action for some weeks this photo realistic mural pictured saw Dale back on his feet and marks his return to the streets. 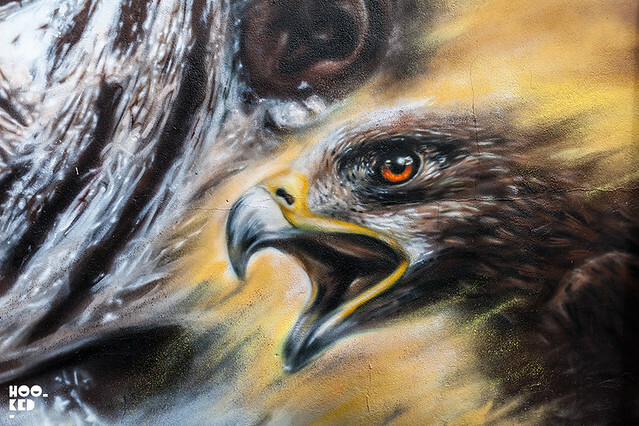 Located on a wall of the Hurricane Rooms at the junction of Hoe Street and Forest Road just opposite The Bell pub which also features another of Wood St. Walls murals featuring a We Like Static collab with stencil artist Teddy Baden. 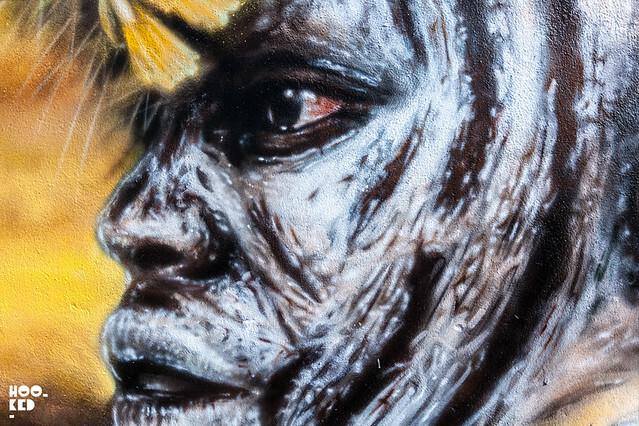 This new mural with Dale Grimshaw brings Wood Streets Walls Project total up to six murals. Hookedblog have previous covered some of the other artists mural on the blog including the work of We Like Static (covered here and here), The Toasters vibrant exploding toasters mural (covered here)and Malarky's recent Rent's Too High mural (covered here). For those wanting to catch the works in person we have just put together an art map with the locations of where all the murals can be found. And what with the upcoming 2015 edition of the E17 Art Trail kicking off on the 30th May it might just be the ideal time to visit this part of London and check out Wood St. Walls street art works. The E17 Art Trail now in it's 11th year, is a two week long program of community led events which will celebrate the creativity in the borough. They will host 250 events and exhibitions and this year will see 100s of local artist open up their studio space to the public. More info on the E17 Art Trail can be found on their website here and our Wood Street Walls street art map is included below.